A Lot Is Included in the Price: And we’re not just talking cocktails! 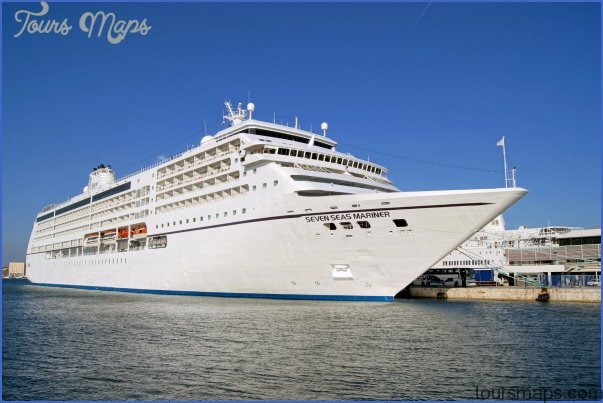 Regent includes in its rates round-trip air (with business class on some routes), unlimited shore excursions, pre-cruise hotel stays and transfers, all beverages, and even gratuities. Stay in certain suite levels, and Wi-Fi is thrown in, too. Overall Excellence: The line serves very good food, has ultra-comfortable accommodations, creative shore excursions, and a peerless staff. Tip-Top Room Service: It’s some of the best we’ve found on a ship, with the food served promptly, fresh, and course by course or all at once your choice (okay, so the room-service pizza isn’t so great). Sedate Nightlife: Although the line has upgraded its evening entertainment, many guests, exhausted afer a full day in port, retire early, leaving only a few night owls in the disco and other lounges. Regent’s brand of luxury is unfussily elegant, its cuisine among the best in the industry. The Regent Seven Seas experience means outstanding food, service, and accommodations in an environment that tends to be less stuffy than Seabourn and Silversea. 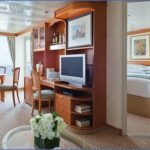 These are some of the most comfortable ships at sea, providing passengers with incredibly spacious outside suites and roomy public areas. 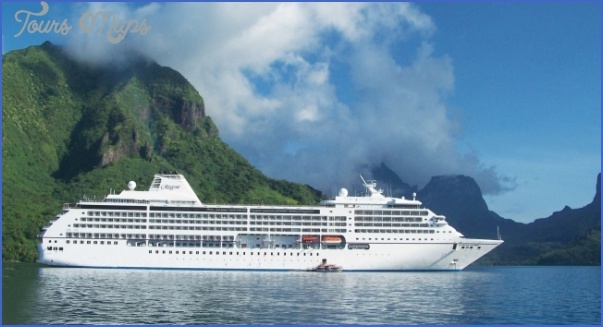 Regent Seven Seas offers everything from the exotic (South America, Africa, India, Asia, and the South Pacific) to the more common cruise destinations (Europe, Alaska, Canada and New England, Caribbean, and the Panama Canal). Regent tends to attract travelers from their 50s to their 70s (sometimes even in their 30s and 40s) who have a high household income but don’t like to flaunt their wealth. 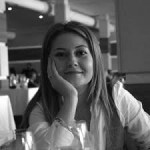 The typical guest is admirably well-educated, well-traveled, and inquisitive. The travelers may also be a mixed bunch. On a recent cruise, the passengers we met included an economist for an international financial institution, a retired auto-parts engineer, and an environmental lobbyist. Regent’s cuisine would garner high marks even if it were on land, with classic continental cuisine as well as more creative dishes (we’re still dreaming about the avocado panna cotta we had). Service by accomplished waiters adds to the experience, as do little touches such as fine china and fresh flowers on the tables. The complimentary wines served with meals are generally quite good; there’s very little reason to want to trade up (however, the wines available at extra cost are actually fairly priced). At the main Compass Rose restaurant meals are always open seating (i.e., you don’t have to pre-book a time to dine); and there are a number of possible table configurations from deuces to ones that can comfortably seat 8 people. Days not spent exploring the ports are unstructured for most guests though there are a variety of activities thrown in for those who aren’t pursuing their own relaxation. These include lectures by experts, golf instruction, card and board games, art auctions, blackjack and Ping-Pong tournaments, bingo, and big-screen movies with popcorn. Bridge instructors are on board for select sailings; check when you make a reservation. Regent ships offer free Wi-Fi for certain suite levels, and the line the offers Internet packages (an unlimited plan that is $29.99 per day, 200 minutes for $160, and pay-as-you-go for $0.99 a minute) for everyone else. And magicians, and sometimes members of symphony orchestras and other musical groups. Other onboard productions include the soundtrack-themed Film Flashbacks, the dance-party hit Dancing in the Streets, and Regent’s classic Broadway, which offers samples from current Broadway productions. High staff to passenger ratios means there’s never any wait for service; and often the service is by real experts. The senior dining room staff generally have had experience at fine hotels as well as on ships. The room stewards and butlers are as accomplished. And we have to give special kudos to the bar staff: During our last cruise, just about all the staff members in the public lounges remembered our favorite drinks after just one meeting. The line also provides dry cleaning and full- and selfservice laundry. On Regent ships, gratuities for the staff are included in the fare and are not expected. The Denali Corridor features prominently in Regent Seven Seas’ land packages in Alaska. The company’s brochure includes 4-night packages originating in Anchorage. The rates start at $2,299 depending on the itinerary chosen. The line also includes a free 1-night luxury hotel stay at the beginning of all Alaska cruises in Anchorage. 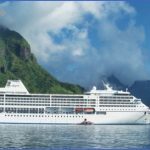 Regent has four ships, the 700-passenger Seven Seas Mariner and Seven Seas Voyager, the smaller 490-passenger Seven Seas Navigator, and the brand-new 750-guest Seven Seas Explorer. Regent claims it’s the most luxurious cruise ship ever built and that’s not far off the mark. 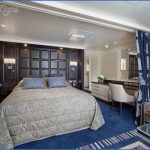 This 750-guest luxury masterpiece is clearly Regent’s most elaborate (and lavish) ship to-date, with the largest-ever suite at sea, a two-story spa, multiple dining options, and a look and feel that is decidedly more lavish than the line’s existing fleet. Regent Suite, which is larger than the average North American house. It’s also far more expensive to live in at roughly US$5,000 per person, per day. For that you get two bedrooms, a living room, a private garden, your own in-suite spa, biz-class airfare, roundtrip transfer from your house to the airport, a free personal guide and car to tour ashore (likely in select ports of call), guaranteed specialty restaurant reservations and more. If you can’t afford that, not to worry: There are 15 other categories of varying sizes to choose from. It’s worth noting that butler service isn’t included in all categories; only Explorer Suites and higher offer this amenity. Public areas & activities The Meridian Lounge on Deck 5 is positioned as the prime bar to enjoy a drink before continuing on to one of the many performances in the lavish Constellation Theatre. Two decks in height, patrons get unobstructed views and lounge-style seating, complete with Murano glass-topped tables. The Explorer Lounge is also a hit, with its deep-blue color scheme, mahogany wood paneling and plush leather chairs. Nightly music is offered here on a stage framed by a golden proscenium, while the nearby casino offers entertainment in the form of one-armed bandits and the usual table games. The ship also carries Regent’s first-ever culinary center, which has 18 individual cooking stations complete with stainless steel sinks, induction cooking surfaces, and walls of fine ingredients. Cooking classes cost $89/person, and last between 90 and 120 minutes. Seven Seas Explorer features the largest spa in the fleet, operated by Canyon Ranch and offering a number of not-so-standard treatments (when was the last time you had an Arctic Sea Ritual?). Before and/or after treatments, guests can try out the hydrotherapy pool, heated thermal loungers, and an outdoor plunge pool. A fitness center is located nearby, and offers complimentary yoga and Pilates classes in addition to the usual fitness equipment. Dining Two brand-new dining options were introduced aboard Seven Seas Explorer: Chartreuse and Pacific Rim. Chartreuse is an art deco beaut with floor-to-ceiling windows and expertly prepared French Cuisine. Pacific Rim, as its name suggests, has Pan-Asian cuisine. Returning to the ship are existing Regent favorites like the Compass Rose main restaurant, the always-delicious Prime 7 steakhouse, and the Veranda Cafe for a quicker breakfast, lunch and dinner. 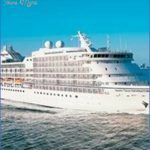 Seven Seas Mariner – Seven Seas Voyager When she debuted in 2001, Seven Seas Mariner became the first all-suite, all-balcony luxury cruise ship on the high seas. 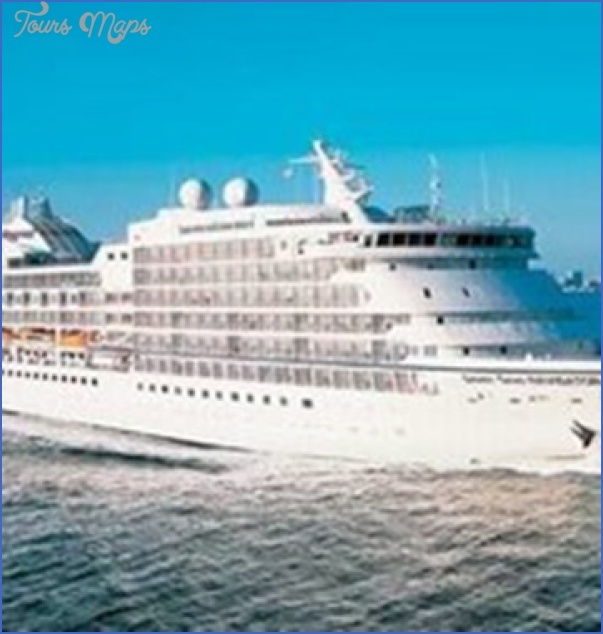 In 2003, Seven Seas Voyager built upon the success of her younger fleetmate, introducing a single-corridor layout much like the ships of competing lines Seabourn and Silversea. Though the two vessels differ slightly, they’re more similar than not, holding 700 guests apiece. Cabins Seven Seas Voyager ‘s accommodations used to feel more lavish than those of her sister ship (indeed, rooms on average are slightly larger), but a 2014 refit rectified that by adding a bit more zing to suites aboard Seven Seas Mariner which got an all new decor of chic soft greys and earth tones. Balconies on both are decently sized, if not totally private: Dividers don’t extend right to the ship’s railing, so expect to say hello to your neighbors. Beyond the starter suites (called Deluxe Verandah, and as we said all accommodations are suites with balconies), there are seven other categories: Concierge, Penthouse, Seven Seas, Voyager, Grand, and Master Suites, Butler service starts with the Penthouse level suites, and top-level suites include sniffy touches like complimentary onboard iPad and iPod use, personalized liquor bar setup, in-suite binoculars and Illy Espresso makers. Six suites on Seven Seas Mariner and four on Seven Seas Voyager are wheelchair-accessible. Public areas & activities The public areas on these ship flow attractively into one another, with winding corridors that heighten the sense of discovery. And what you find are lounges, bars and other areas that are spacious and decorated with rich navy blues, brass accents, and soft earth tones. On both ships, the Constellation Theatre is a multi-story affair, with superb, unobstructed sightlines from every seat in the house. The Horizon Lounge is a go-to spot for nightcaps, while high tea is offered here during the day, accompanied by the ship’s resident pianist. A swish Connoisseur Club on both ships has a selection of cigars and fine cognacs. Seven Seas Mariner has a dedicated disco, the Stars Nightclub, located on Deck 6, while Seven Seas Voyager carves a disco out of the cozy Voyager Lounge at night, complete with a live DJ. 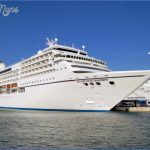 Both ships have one midships pool, along with paddle tennis, golf tents and that ubiquitous cruise staple: shuffleboard. Both ships have a small-ish Canyon Ranch Spa, while a diminutive but functional fitness center contains everything you need to keep those dessert-pounds off. Dining Speaking of dessert, both ships have four restaurants apiece, starting with the main dining room, the dinner-only Compass Rose. We’d describe the food served as a step below what you’ll get aboard rival Crystal Cruises, but still unusually good for shipboard fare. Buffet breakfast and lunch, with a la carte options available for order, are served in the casual, indoor-outdoor La Veranda; again these aren’t as spectacular as Crystal (they could use more variety in the day-to-day selections) but still quite fine. At night, this dining space transforms into Sette Mari at La Veranda, featuring highly authentic, multi-course Italian meals paired with regional wines. Better are the two dinner-only specialty restaurants: Signatures (French fare) and Prime 7 (a contemporary, and very glam, steakhouse). Both are complimentary, but require advance reservations. For lighter fare, the Coffee Connection serves up sandwiches, cookies and the like not to mention caffeine-laden beverages of all kinds. Seven Seas Navigator Fresh from an extensive drydock in the spring of 2016, Seven Seas Navigator has never been more luxurious. Carrying just 490 guests, Seven Seas Navigator has always been one of Regent’s most comfortable ships. Public rooms are numerous and smartly laid out, while outer deck areas are so spacious that you’d practically have to go out of your way to bump into your fellow guests. 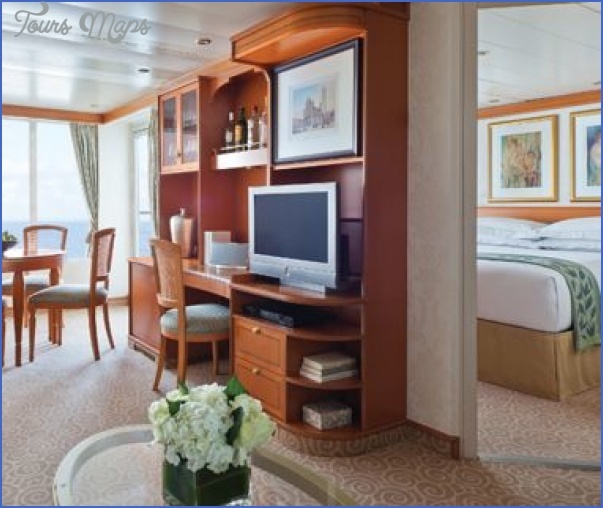 Staterooms are equally roomy, each facing the sea (no inside cabins here!) with nearly every cabin on board featuring its own private balcony. Throw in an extensive 2016 refit that saw sweeping aesthetic changes, and Seven Seas Navigator easily holds her own against her larger, newer fleetmates. Cabins Another all suite ship and a full 90% of those have private balconies. All are spacious with walk-in closets, European king-sized beds (they’re four inches wider than kings in North America), a marble bathroom with a shower and tub, and brand-new soft furnishings. The look of the rooms would appeal to mermaids: elegant blue headboards, sea-foam runners and carpeting, and plenty of wood and brass accents. Penthouse Suites and those in the categories above, feature dedicated butler service and cream-and-copper tones on the walls and drapes and carpeting. 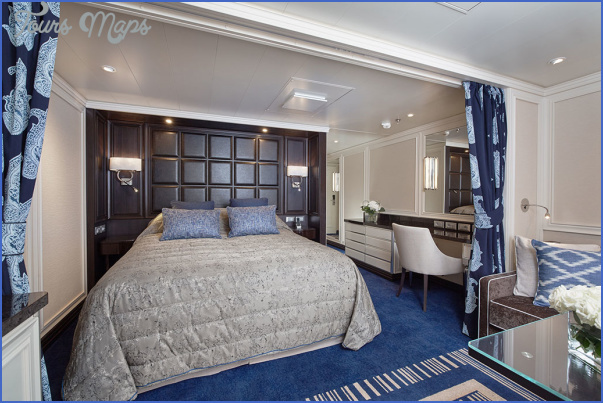 The largest of the accommodations on board are the ship’s Master Suites, which come with a massive private balcony that’s over 100 square feet in size. Each has separate living and sleeping areas and little touches like an Illy espresso machine, complementary iPod and iPad use, and an iPod docking. Four suites are designated as wheelchair-accessible. Public areas & activities For a ship of this size, there’s a surprising number of bars, lounges and places to hang both by day and at night. After a recent renovation, the reception lobby now makes a stunning appearance, illuminated by a gypsum diamond cut lighting fixture. The lobby’s adjacent, and entirely unexpected, eight-deck high atrium, comes complete with panoramic glass elevators. 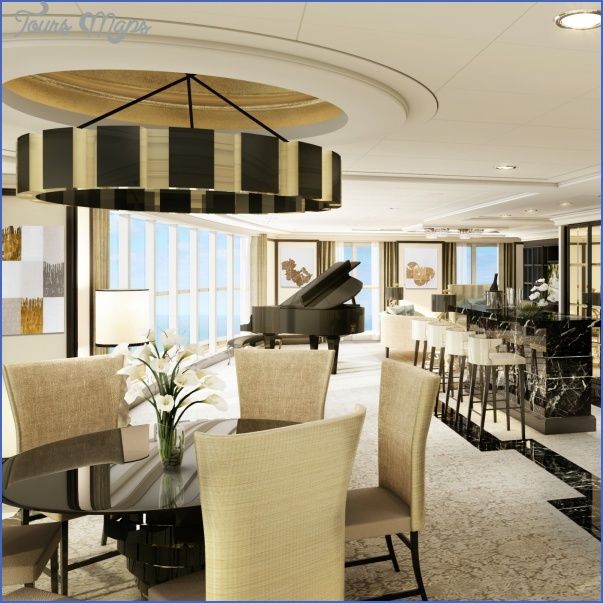 The ship features a small casino; and a number of swell lounges, including Galileo’s, an aft-facing piano lounge. The two-story Seven Seas Show Lounge is where evening production shows are performed. A large pool and two hot tubs can be found amidships, surrounded by relaxing lounges, and, not so coincidentally, adjacent to the Pool Bar. The ship’s small Canyon Ranch SpaClub is low-key meaning there’s no push from Canyon Ranch staff to purchase products you don’t need. The fitness center, sadly, isn’t large enough and tends to get crowded particularly on sea days. By offering made-to-order burgers, milkshakes, sandwiches and fresh salads. The Coffee Connection is the place to go for all your caffeine needs, plus snacks and sandwiches. Seven Seas Navigator has two specialty restaurants: Prime 7 (a steakhouse) and Sette Mari at La Veranda (Italian). Both require reservations, but are complimentary.